Who’s Ready for a Xanax? : An SML Review of mother! Home Horror Reviews Who’s Ready for a Xanax? 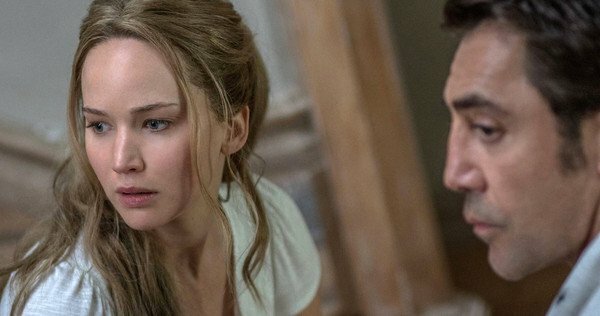 : An SML Review of mother! There are movie reviews that help you decide if you want to somehow drop $27 for a matinee showing or wait until it’s streaming for free. And there are movie reviews that help you unpack the cinematographic madness that you just witnessed so your head doesn’t feel like it’s been smashed by a lemon wedge wrapped around a large gold brick. Javier Bardem, who plays “Him” (none of the film’s characters are personified with names), is a poet and author in the frustrated throes of writer’s block. 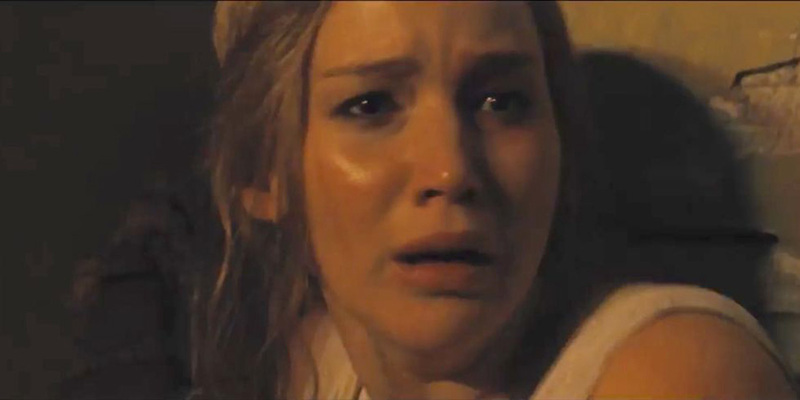 Jennifer Lawrence is “Mother,” who is not afforded a profession. Instead, she has made it her life’s work to lovingly restore her husband’s home after it was destroyed by a fire, literally feeling out each of her design choices. She serves as His biggest fan, earth mother-like inspiration, and the heart of the home (a metaphor that comes to fruition in the final scene). The bucolic, if somewhat stale, lifestyle the couple have built is disrupted by an evening guest who “mistakes their home for a B&B.” In truth, it was no mistake at all, but He obliges the Man on the couple’s behalf. Upon allowing one snake in the door, so to speak, the couple’s lifestyle is immediately and irrevocably upended. Now, you’re going to read that as many people gave this wildly divisive film 0 stars as gave it 10. Those critics will by and large cite plot holes and lack of storyline as the reason for their frustration. It is true that the filaments of this plot do not weave together in a typical linear fashion. But while many claim that threads are missing, I would insist instead that they entwine like the lines of an Escher drawing, looping back on themselves in a way that’s beautiful and intriguing, if structurally unfeasible. You’re also going to read a lot about biblical allegories (as well as some environmental and political undertones). I confess that were I not primed to see them, and then discussed them at length afterward with my viewing partner, they would have largely gone over my head. I’m not typically inclined to see biblical parallels, so I found the symbolism of the first half of the film to be carefully understated. However, there is no ignoring the wild-eyed, deadly zealotry that dominates the last act. In any case, I’ll let you choose how much religion you want to see in the film. Check out Variety and The Telegraph to begin your research. Regardless of the reviewer, however, there is no mistaking the tone and pacing of the film. The tight camera shots put viewers squarely in Mother’s point of view, often showing her body from her own perspective. The shots also served to narrow the perspective of the camera without the gauziness of shallow focus in every scene, especially as chaos unfolded over the course of the story. The camera also followed Mother around, the only entity in the film that cared enough to remember her. While we were always with Mother, the tight shots made it difficult to gain perspective on the rest of the scene, heightening the ever-growing anxiety made all the more apparent by complete lack of soundtrack. In the end, mother! was two hours and one minute of your most fevered anxiety dream. Mother’s timidity lacks a convincing assertion necessary to reinstate order in all those around her. She is blatantly ignored and completely out of control in her own home and physical space—to the point of being violated by the strangers. And all the while, each invasion happens at night, when any peace she would have had is greatly disrupted, any shock magnified, and sensibility becomes a lesser concern. Her powerlessness is physically palpable. 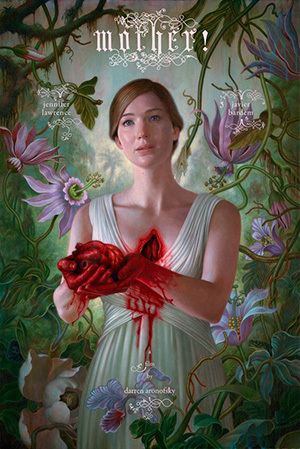 I leaned across the armrest at several points in the movie to confess to my companion, “This is exactly what my anxiety dreams feel like.” Now, days later, I feel the same as I did walking out of the theater: I want to watch mother! again—a half dozen times, even—to capture every nuance, to call “gotcha!” to every newly recognized reference. But physically, I need some time. I’m not sure I’ll ever be able to watch it again at all. mother! is truly and completely physically exhausting—a mass of emotions that you can feel from tip to toe. It’s an experience that must be suffered, and afterward you wonder how you ever got through it and whether you could survive it again. Perhaps in this way, it most lives up to its name. I have no regrets about seeing mother! I would like to do it again when I’m ready. A part of me even thinks everyone should go through the experience at least once in their lifetime. But it’s not an experience to be rushed, or forced. And I cannot in good conscience recommend it. You must discover mother! at your own pace, and in your own time. Darren Aronofsky, Horror film, movie review.